Pru is shouldering guilt for the consequences of her parents actions. She has spent years making sure the families touched by those actions do well, move on, get settled, etc. The O’Reilly brothers are the last and she’s determined to see how she can make their lives better. Finn O’Reilly, co owner of the pub O’Reilly’s with his brother, is immediately drawn to Pru, and an innocent flirtation soon turns into something a lot deeper. The setting is San Francisco, and the city definitely has a presence in this novel, as do the circle of friends who draw Pru into their group, without asking a lot of questions. Only Pru’s best friend, and ex, Jack, knows the mission she has made for herself, and he preaches the consequences of those actions, if she continues to hold back from Finn and her new group of friends. Pru, having the best of intentions, is quirky, fun and sweet. You can’t help but root for her, and the perfect bodied, and in much need of fun Finn. I loved them separately, but loved them even more together, which is the sign of a well written romance. This the first in the series, and I can’t help but hope that at some point, the author chooses to write Jack’s story, because there is a well of hidden depths in his character, and I need to know the answers to his mystery. Please, Ms. Shalvis, hear my plea! I was privileged to have met Jill Shalvis at the RT Convention this last April, where she signed an ARC of Sweet Little Lies for me. You’ll be able to receive your own copy on June, 28, 2016. This was the perfect beach vacation novel, as you can see from my picture, taken while on vacation in Key West this June. It is light and fluffy, but has a backbone, as all of her books do. 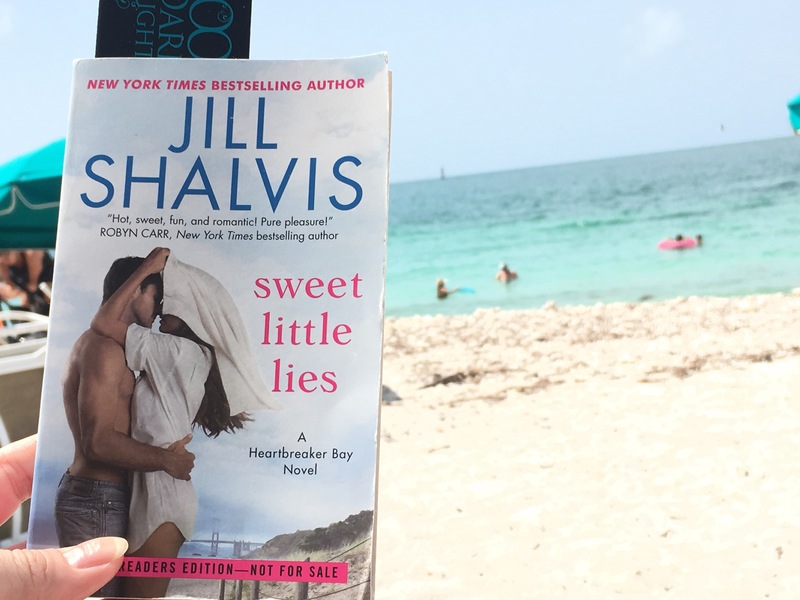 Pingback: This Chick Read: Sweet Little Lies: A Heartbreaker Bay novel by Jill Shalvis — A Chick Who Reads | Lisa's -Home for Books and More!